Sixty-eight degrees with overcast skies! Ahhhh! Despite my relief that the heatwave had finally broken, I was still miffed that this morning’s forecast called for rain and even thunderstorms. Couldn’t the rain wait until after our sketch outing? 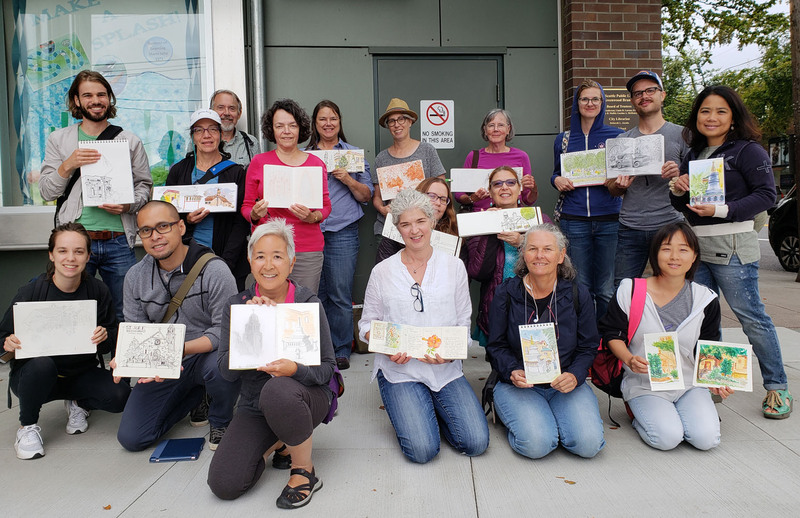 In fact, it did wait until the throwdown, so we all stayed dry while sketching the Greenwood neighborhood. 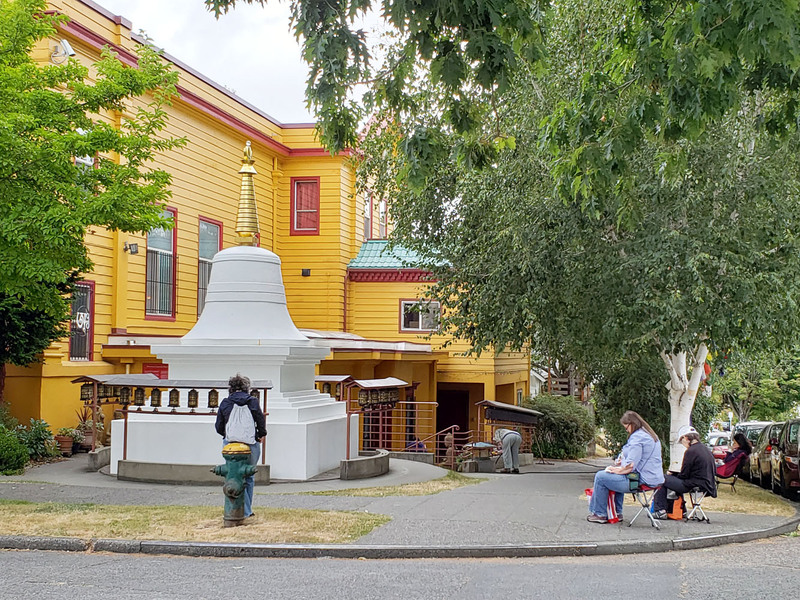 Our sketch outing featured two places of worship within a couple of blocks of each other: The bright yellow and red Sakya Monastery of Tibetan Buddhism and St. John the Evangelist Catholic Church. 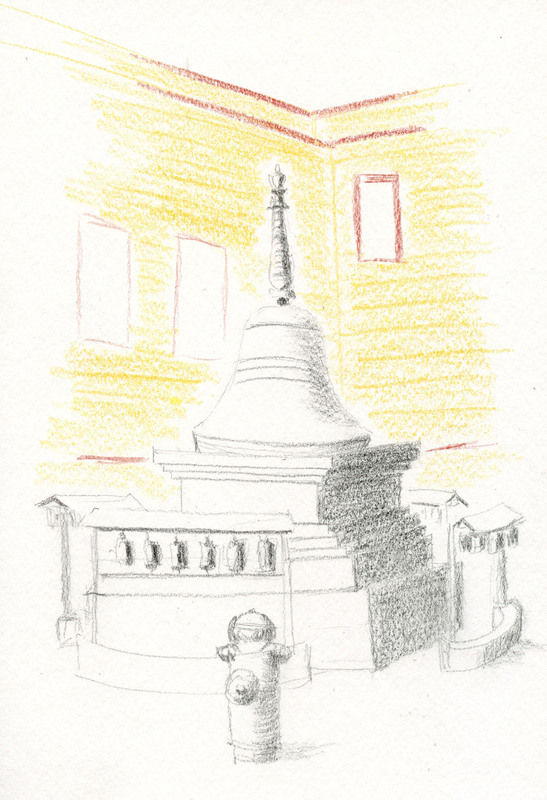 I’ve sketched the monastery’s front entrance flanked by twin lions before, so today I went for the large bell at the side of the building. 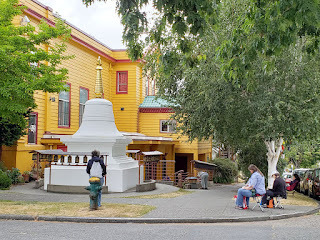 The bell is surrounded by stands of percussion instruments that make a soothing rattling sound when spun. Arriving before the other sketchers, I had seen someone come out of the monastery, walk around the bell and spin the instruments before stopping for prayers at the entrance. 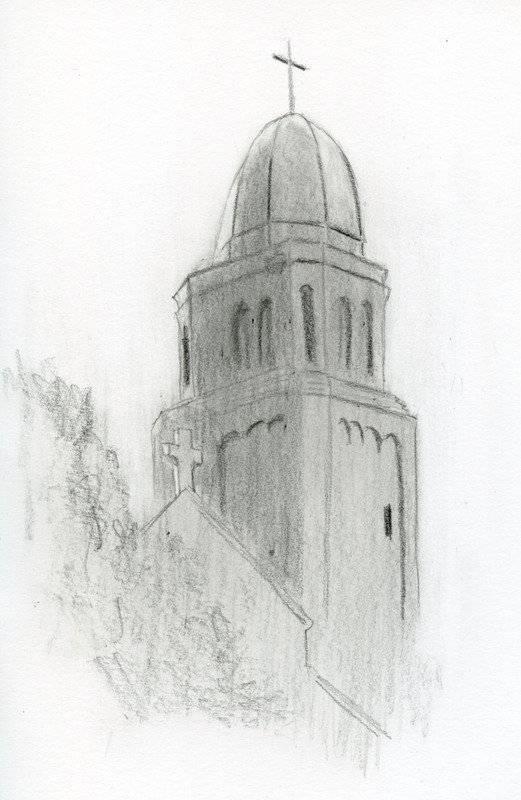 Sketching St. John’s was a second attempt for me, too. More than five years ago I stood on the opposite side of the church and struggled with both the perspective and watercolor. At least I didn’t have the challenge of watercolor this time, but the perspective was no less a struggle. Giving it a shot with Eduardo Bajzek’s graphite method, I had a new difficulty: trying to make sense of the confusing values. The brightest spot on the building was the barely visible left face of the mitered top (the curve reflecting the sky), yet the sun (hiding behind thick clouds) was lighting the right side of the rest of the church. The weather report didn’t scare away any sketchers! In fact, we welcomed several new faces, including Gigi, who was visiting all the way from Rio de Janeiro (front row, second from right).